About | Frederick Harvesting & Trucking L.L.C. 1980s 1983 marked the beginning of a family operated business known as Frederick Harvesting. 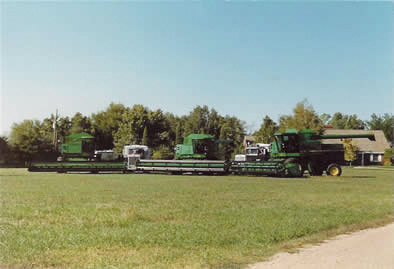 The first harvest run was made with a John Deere 8820 combine and a tandem truck. In these early years, many of the customers and harvest stops were established that the business continues to serve today. As years past, the business continued to steadily grow through the 1980s. In 1989, we purchased three new John Deere 8820 combines, making it possible to harvest more acres than ever before. 1990s The 1990s brought about numerous changes for our company. The number of combines quickly grew from 3 to 6 in a matter of just a few years, and the business updated to John Deere's latest 9600 Model combines. At this time, fall crop acres increased substantially, bringing about the need for additional equipment. In 1998, Frederick Harvesting upgraded to the newly released John Deere 9610 model combines, and began experimenting with 36 foot draper heads. 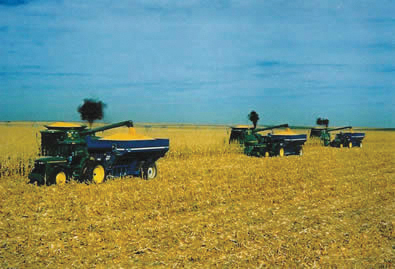 2000s In the spring of 2000, we upgraded the fleet to the new 50 series STS combines. Four years later, we equipped each combine with a 36 foot draper header. Today, we operate John Deere S series combines equipped with 40 foot draper heads. As the years go on, Frederick Harvesting continues to strive to provide the best service possible for their customers. The 2000s have brought about many challenges in the world of agriculture, but we look forward to the future and the opportunities that it holds as we continue Harvesting The Grain That Feeds The World.